Send comments and suggestions to "maccabe at cs.unm.edu"
The backlight on my Thinkpad T21 died over the July 4th holiday. When I returned on Monday the 8th, I looked to find a replacement for a trip I was taking on the 9th. The lab staff was building a Dell Latitude x200 for the chairman, but they were about to return it because they couldn't get the DVD CD/RW working under Linux (we did manage to get it working). I needed a laptop for a trip and didn't really care about having the disk work. I grabbed the x200 and have been having fun ever since. The intent of this page is to document how I got various things working under Linux on a Dell Latitude x200. While my machine is dual booted, I almost never run MS Windows, so making things work under Linux is pretty critical to me. I assume that you are fairly familiar with Linux and are comfortable doing things like re-building kernels. As such, lots of those kinds of details are not documented here. If you need something that isn't documented, feel free to drop me a note and I'll try to answer your question. I have been running Linux on laptops since 1994 when I convinced my wife that it would be OK to buy that Sharp notebook. As I recall, the machine had 8MB of RAM, a 1GB drive, a floppy drive, and a VGA display (it was important to shut down X when compiling the kernel). Slackware required 52 floppies. Since that machine, I have had two Gateway laptops (an original Solo and a 2300) and the Thinkpad T21. There aren't very many pages on this machine yet. The Gateway 200 is virtually the same machine, but it is almost impossible to define a search for the Gateway 200 (too bad they didn't use something other than "200"). It seems pretty clear that both the Latitude X200 and the Gateway 200 are really Samsung Q10's with minor modifications. A saleskid at the local Gateway store tried to convince me that they were both made by Sony. The machines certainly share many features with the Viaos (battery in the back), but there are significant differences (the video chipset, the ports are on the left instead of the right, the display border is not the same shape as any of the Sonys, etc). Dell Latitude x200: Brian's page covers the steps in getting RedHat 7.3 (now the beta release of RedHat) working. Liberating the Dell Latitude C400: The C400 and the X200 share quite a few components in common and this site has good information on how to configure these components for Linux. Setting up FreeBSD on a Dell Latitude x200 laptop: When things work in FreeBSD, it is so much easier to configure. Note, there may be many more pages out there. Google seems to take a couple of weeks to "find" new pages and the Linux on Laptops page hasn't been updated since March 26th! This is a fantastic laptop. It is amazingly light (less than 3 lbs), but feels very sturdy. The display (1024x768) is small (compared to the 1400x1050 on the Thinkpad), but very bright and clear. The battery life with the default battery is only 2 hours, far too short for any significant travel. I have ordered the larger battery. I live on my laptop. I do not have a desktop in my office and rarely use my desktop at home. Given this, I had assumed that I really needed a "desktop replacement" class machine. The x200 is changing my perspective. Overall, this is a keeper. IBM has fixed my Thinkpad (we sent the machine in on a Friday and it came back on Monday! ), so I'm facing a tough decision. When I use the Thinkpad, it doesn't seem too heavy, but when I go back to the Dell, I am amazed at how light it is..... At this point, I use the X200 when I'm in travel mode and the T21 when I'm in mostly in town. The base machine costs about $1,680 and comes with a 12.1" XGA display, 128MB RAM, a 30 GB Ultra ATA disk, an internal 56K winmodem, an internal 3Com 10/100 Ethernet card, an 800 MHz Mobile PIII processor, an external (firewire) CD ROM, and a single (Type 1 or 2) PCMCIA slot. Adding 512MB RAM (total 640MB), a bigger battery, an extra power brick, internal wireless, and upgrading the external drive to a DVD CD/RW combo, brings the price to about $2,650. There is no IrDA! A bit annoying because I was using IR to sync my Sony Clié. I managed to get USB based synchronization working. While it means that I have to use the cradle to sync, it is faster and more reliable. I am running Debian GNU Linux (sid, AKA unstable), Linux kernel 2.4.20 and XFree86 4.2. The internal 3Com card works. Mini PCI wireless works. It gets handled like a PCMCIA card, so you can use cardctl to "eject" and "insert" the wireless. The internal modem works, but you need to hack the source code for the driver. The external DVD CD/RW works, but you need to run a very recent kernel and use modules for the firewire drivers. You can burn audio and data CDs. DVDs work just fine (using ogle). X11 works, although you need to run XFree86 4.2. DRM and DRI do not work. According to Intel's Web pages, you need to download the xfree86 source code an build the i830 module. Unfortunately, neither the i810 nor the i830 kernel modules compile cleanly with 2.4.19rc3. I haven't looked into this too deeply, and it may be easy to fix. For now, it's low priority. The hard drive is not correctly identified by the kernel. Running "hdparm -t -T /dev/hda" reports good cached reads (166 MB/s), but very poor buffered reads (3.2 MB/s). It is my understanding that this will be fixed in the 2.4.20 kernel. The sound card works for the most part, but does not play wav files. This means that you cannot turn on gratuitous sounds for Gnome. I also have problems with most CD players. I have installed ALSA drivers and things improved quite a bit: wav files work and the alsaplayer will play audio CDs. While this is working, I really do not like the whole ALSA thing (configuration is a nightmare) and will continue to consider that sound is broken until it is fixed in the kernel. APM also works, but I have encountered hard lockups when I plug in the AC power. This is very infrequent. Running ACPI might fix this problem, but seems to conflict with PCMCIA services. I have not looked into this yet. When I received this machine, the support staff had already partitioned the disk and installed Linux, so I didn't have the joy of doing the initial install. The system should boot from the CD without any trouble (the BIOS understands the firewire drive). However, once it is booted, the Linux kernel will not recognize the drive, unless your distribution uses a fairly recent kernel and you can install the appropriate modules (see the discussion related to the external disk below). This would be a show stopper, except that the kernel will recognize the built-in network controller, so you should be able to do a network install. Anyway, I always use my custom kernels so this is not really a big problem. Here's my current XF86Config-4 file and here's my current kernel .config file. The video chip is an Intel 830M. This is a fairly new chip, but it is well supported by Intel, they even provide Linux support. You must run Xfree86 4.2 to use this chipset. While the standard Debian distribution does not support this release of Xfree86, testing debs are available from the maintainer for sid (unstable). Jul 23 09:14:17 munchkin kernel: agpgart: Detected an Intel 830M Chipset. Jul 23 09:14:17 munchkin kernel: agpgart: detected 8060K stolen memory. (II) I810(0): detected 8192K stolen memory. (**) I810(0): Default mode "800x600"
(**) I810(0): Default mode "640x480"
Jul 23 09:14:17 munchkin kernel: ICH3M: (ide_setup_pci_device:) Could not enable device. This machines uses a pctel modem. Linux drivers are available from The unofficial PCTEL linux modem site. 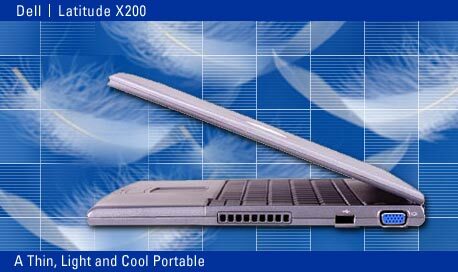 The current version, 0.9.3, requires a slight modification to work with the x200. Download and untar the source tree. Configure the code: "./configure --with-hal=i810"
This was taken from Liberating the Dell Latitude C400. This makes the modem work, but I suspect that something more is needed as I do not hear any of the standard modem sounds when the modem is dialing or connecting. Now, do the "make install" thing to install the modules. If you want the modules automatically installed on boot (the pctel.o module is pretty large, so you may want to install it as needed), add pctel and ptserial to /etc/modules. Remember to enable PPP in the Network Device Support part of the kernel configuration. When it is installed, the modem will be attached to /dev/ttyS15, i.e., "ln -s /dev/ttyS15 /dev/modem"
Jul 23 10:13:18 munchkin kernel: PCTel driver version 0.9.3 [5.05c-4.27.215 (09-14-2001)] (MR) (2002-01-31) with MANY_PORTS SHARE_IRQ SERIAL_PCI AUDIO_ROUTING[INTEL] enabled. Jul 23 10:13:18 munchkin kernel: PCTel driver built on [Linux 2.4.19-rc3 i686 unknown "2.4.19-rc3 <132115>"] with gcc-2.95.4. In addition to the modem, this machines comes with a built-in 3Com Ethernet controller. This works fine. As noted earlier, making the external DVD CD/RW work under Linux is not a high priority for me, but I did manage to get it working to an extent. I suspect that the big problem is in the hotplug support -- this is a new machine and it looks like the Linux hot plug stuff doesn't quite know about this particular drive yet. Once everything is in place, the device will be /dev/scd0, i.e., "ln -s /dev/scd0 /dev/cdrom"
after "modprobe ieee1394; modprobe ohci1394"
at this point, the kernel also inserts the cdrom and sr_mod modules. The sound card sort of works. It seems to be detected correctly, but it has problems playing wav files. Freeamp seems to work just fine for playing mp3's. The sound card is a Cirrus Logic CS4299 integrated in the Intel i810. I have not tried using the ALSA modules. Jul 22 16:44:40 munchkin kernel: i810_audio: Audio Controller supports 6 channels. This machine has three USB controllers! The important thing is that it has two USB connectors, one on the left and another on the right. My goal in enabling USB support was to make it possible to sync my Sony Clié using gnome-pilot. If you have other USB devices, you may need to change things a bit, but it should work. Notice that the serial converter components are compiled as modules. The modules are usbserial.o and visor.o. I added these to /etc/modules so I don't have to remember to insert them. Alternately, you could use "modprobe visor.o"
For my purposes, APM provides two critical services: suspend/resume and an indication of how much battery remains. Both of these work, although the battery only reports percentage remaining. On several occasions my machine has frozen when I plug in the power cord while running on battery. I can move the mouse cursor for several seconds after plugging in the power cord. Then the screen goes white and the machine is locked up. The only thing I can do is to power cycle it. I tried enabling ACPI; however, there is a conflict with pcmcia services and I have not explored this in any depth.